Nicolaus Copernicus (1473-1543) was an amazing man by the standards of any age. He was a physician, had a degree in law, spoke multiple languages, was a mathematician, translator, an officer of the church, administrator and governor of church lands, an economist and an astronomer. With crude instruments (and no telescope) he observed the night sky. And the data he collected told him that the Earth and planets orbited the Sun. I wonder if it’s possible for modern readers to fully understand how mind-blowing this revelation must have been? Or how dangerous? 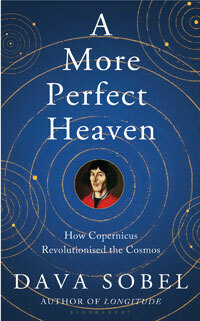 Copernicus lived in an era of contradictions – the Renaissance & Reformation were both in full swing. Men like Leonardo da Vinci, Michelangelo and Martin Luther were changing the world. But the church was still very much in control. One of the chief arguments cited against a heliocentric universe was the biblical passage Joshua 10:12-14. It states “And the Sun stood still, and the Moon stayed, until the people had avenged themselves upon their enemies.” The Catholic church insisted on a literal interpretation. It seems unbelievable, illogical and ridiculous. Yet 90-years after Copernicus’ death Galileo would stand before the Inquisition and be forced to recant his support of Copernicus’ findings. Dava Sobel makes “the Copernican Revolution” emotionally accessible. She establishes the historical context and immerses her readers in it. A More Perfect Heaven: How Copernicus Revolutionized the Cosmos is part history, part speculation; the literary version of an interactive museum exhibit. Sandwiched between two sections of fairly traditional, narrative non-fiction is a two act play in which she brilliantly addresses the turning point in Copernicus’ life. She tells how Georg Joachim Rheticus (a young mathematician and a Protestant) arrived on the 66-year old astronomer’s doorstep and somehow convinced him to publish his findings. The play humanizes the historical figure. We are made privy to the worry, indecision, sacrifice and fear. While the actual conversations may be Sobel’s creations, the mental state behind them is indubitably authentic. Dava Sobel does a lot of things right in A More Perfect Heaven. She’s a hell of a writer. For example, when discussing Copernicus’ time as a district administrator in the diocese of Varmia Sobel randomly sprinkles excerpts from the official ledgers he kept amidst details of his duties and scientific research. The result creates a three-dimensional picture of the astronomer’s daily life. …With or without calendar reform, Copernicus still needed to ascertain this fundamental parameter. The length of the year defined the Earth’s orbit around the Sun – or, as other astronomers believed, the Sun’s orbit around the Earth – and pertained to almost every calculation in the heliocentric or any other planetary theory. Copernicus fashioned a new yardstick for the eyar in an open loge on the south face of Allenstein Castle, just outside his private apartment. Laying white stucco over the ruddy bricks, he painted the gird of a sundial onto the smooth surface. The lines and numbers must have been black and red when new, though only a hint of color survives in the faded dial fragment still clinging to the castle wall. Underneath, either on a table or the floor, he set a mirror – or maybe he used a bowl of water – to catch the Sun’s reflection and throw it up to the dial, where he charted the changing solar altitude through the seasons. Part 3 of A More Perfect Heaven discusses the journey from manuscript to book. It provides portraits of those who facilitated the publication of On the Revolutions of the Celestial Spheres, and gives credit to the ones who built on Copernicus’ theory and played a part in its eventual acceptance. Sobel covers all the angles. Mostly, though, she tells a great story. One that entertains. No prior scientific knowledge required.